Farewell, Napa. Hello, San Francisco. Friday was our last morning in Napa. I’m sure there are a lot of great breakfast/brunch spots in Napa, but we could eat at Oxbow every morning and be perfectly happy. We ventured from our regular tacos at C Casa for their awesome breakfast burrito and cinnamon roll. We ate it all before I could get a good picture of our meal. Leaving RiverPointe – it really felt like a little home! Before driving back to San Francisco, we decided to head back to Domaine Chandon for a quick stop. We had such a great tour there the day before, but had rushed out to our next tasting that we didn’t get to fully explore the grounds. We initially thought we would just go take a few pictures and walk around, until I remembered that as new wine club members, we get free tastings every time we visit. Twist my arm, I guess I’ll have a glass of sparkling wine at 10am. One observation while we were there Friday morning: As we got out of our car, we saw a group of 20 people getting ready for their tour. I’m so glad we visited on Thursday and had been in a small group of four people and got to ask our guide a ton of questions. I highly recommend visiting the wineries during the week for this reason. Before we left the wine country, we had to take the funny video below outside of Chandon. Hey, cutie. After our stop at Domain Chandon, we drove back to San Francisco for the weekend. I’m sure locals get used to it, but I am always blown away at how tall the towers are on the Golden Gate Bridge. While we usually stop for pictures at the lookout point coming out of the city, we decided to try a new spot this time as well: Fort Point. If you can only pick one place to stop for pictures, I would choose this one over the lookout spot right after the bridge. Yes, you do get the city behind you with the lookout spot, but I love how you get such a sense of how tall the bridge is from Fort Point. We took more than a few pictures there and enjoyed the water crashing up against the rocks before check in at the Coventry Motor Inn one more time. Now, when we were first deciding if we wanted to take this somewhat last-minute trip to San Francisco, we saw that Of Monsters and Men would be playing in nearby Berkeley that same weekend. This sealed the deal for us. We had to make this trip. Chip and I both love music, but we don’t always enjoy the same artists. I’m a sucker for catchy pop music (I’ll always fan girl over boy bands, no shame at all), and I tease Chip about his alien music full of weird synthesizers. But Of Monsters and Men is a band that we both really enjoy and love listening to together. Certain songs from their first album will give me serious nostalgia for our first trip to Nantucket. While Chip was at his conference, I would sit out on the porch at Century House, working on emails and listening to “Little Talks,” “Dirty Paws,” and “Love Love Love” nonstop. Their new album Beneath the Skin came out in June and was pretty much always on at home and in the car for a few months. Once we realized this concert was happening Friday night, we planned our entire trip around it. So after checking back in at the Coventry Motor Inn, we hung out at the Ferry Building for part of the afternoon before driving out to Berkeley for the concert at The Greek Theatre in the UC Berkeley campus. It wasn’t until we parked our car near UC Berkeley that we realized we hadn’t locked the doors while we were at the Ferry Building… and someone had stolen my American Giant hoodie and Chip’s sunglasses. So not cool. They left behind the blankets we had packed, so we fortunately still had those to sit on during the concert. After I got over being insulted by this petty theft, we went to Eureka! for dinner and enjoyed some great burgers before walking to The Greek Theatre. Now, this outdoor venue is designed to look like an old amphitheater with a round seating plan. The seating is unassigned and broken into three sections: the pit (where you stand the whole time), the orchestra (where you sit on cement steps, which is why we packed blankets), and the lawn. After reading online reviews from veteran concert goers, we decided to sit in the orchestra section. We wanted to get some good seats in this section, so we finished our dinner and walked a mile through the UC Berkeley campus, checking out all the buildings along the way and got to the concert gates before the doors opened. The line was longer than we anticipated when we showed up, but most of the early comers went straight to the pit, so we got a great spot in the middle of the orchestra section. I can’t say enough good things about the concert. The opening act, Amason, was great and did a great job setting the tone for the night. Chip and I had been debating over what we thought would be Of Monsters and Men’s first song. Would it be from the old album? The new album? We went back and forth on it, but neither one of us expected it to be “Thousand Eyes.” We didn’t even think they would perform this song. I’m so glad we were both wrong because this was AMAZING live. It was so dramatic with the lighting and the drums. The song ended and we just looked at each other and laughed. We knew the rest of the concert was going to be incredible and we were not disappointed. There are songs that I liked before, but after hearing it live, I love them. Who would have thought an accordion would make “King and Lionheart” sound so good live? Looking back on the concert four months ago, some of our favorite memories are singing along to “Dirty Paws,” following the drummer’s lead to clap the beginning of “Slow and Steady,” and listening to “Crystals.” They did such a great job interacting with the audience and we loved comparing how the lead singer Nanna sways as she sings while fellow band member Ragnar bobs his shoulders up and down as he plays the guitar. I’m keeping my fingers crossed that we can see them again another time. As soon as they started playing “Little Talks,” the sweet preteen in front of us started dancing like crazy. It was awesome. The pictures below are from the Of Monsters and Men Facebook page. Love the view they had of the audience! Of Monsters and Men Facebook Page. The fancy blue arrow is the area where we sat. This entry was posted in Eating Out, Trips and Travels and tagged American Giant, Berkeley, Chandon, Domaine Chandon, Fort Point, Golden Gate Bridge, Greek Theatre, Napa, Of Monsters and Men, Oxbow Public Market, San Francisco, travel, Vacation, Wine Country on February 21, 2016 by the nance familia. After our tasting at Pride Mountain Vineyards, we drove back into downtown Napa to check in at our hotel. We originally hoped to find a place through airbnb or VRBO, but we couldn’t find anything in our price range. If you’re traveling to Napa with a larger group, I highly recommend a rental home. We went that route last year with my family, and had a great time having a home to spend time in. Since we couldn’t find any for this trip that worked for us, we considered our hotel options. There aren’t many chain anythings in Napa, save for a Starbucks and Panera Bread, so it felt slightly out of place to consider staying at a Best Western or other chain hotel. Napa also has a few really nice four to five star hotels, but these were definitely out of our price range. Reading through reviews on TripAdvisor took us to RiverPointe Napa Valley and we couldn’t have been happier with it. It was the perfect middle ground between a hotel and a rental home. We loved how close it was to downtown Napa, giving us the option to walk to Oxbow Public Market in the mornings for breakfast and quick access to some great restaurants for dinner. These mini condos/mobile homes gave us our own space, complete with a kitchen and living room, but still offered some of the amenities of a hotel, like a wine tasting our first afternoon in Napa. We weren’t expecting this tasting, so we were pleasantly surprised when we checked in just before the event started. And yes, we were by far the youngest couple in the room but we had such a great time getting to meet some of the other people staying at RiverPointe. Everyone becomes a friend when you’re having a glass of wine, right? After our tasting, we drove to dinner at Bistro Don Giovanni. We had visited Don Giovanni for lunch during our first trip to Napa a few years ago and really enjoyed it. When we told friends we were going back to Napa for this trip, we heard more than a few recommendations to go to Don Giovanni for dinner. One look at the menu solidified our decision. It was crowded there, so be sure to make reservations if you want to make Don Giovanni part of your Napa experience. Everything on the menu looks great, you really can’t go wrong there. We also had a super sweet waiter from Croatia. 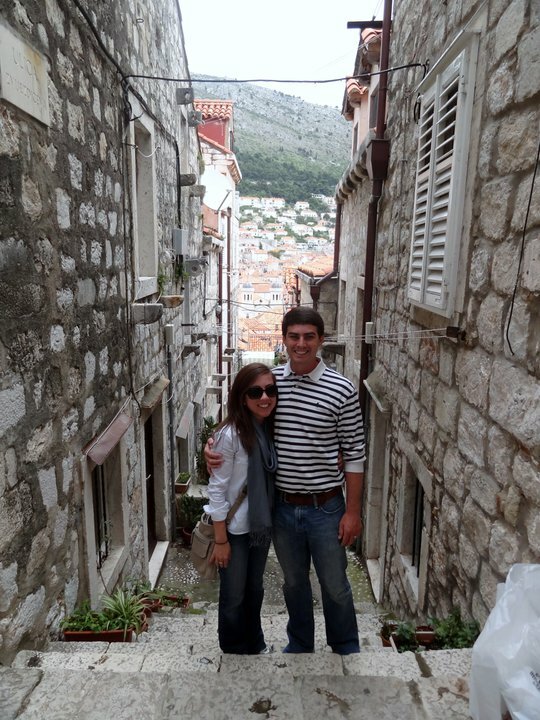 He loved hearing that we spent a day in Dubrovnik during our honeymoon, and then showed us pictures of his family while we ate. Thursday morning started off with breakfast at Oxbow. Seriously, we love this place. We considered a few options for breakfast, but in the end went with C Casa. You can’t beat their breakfast tacos. After breakfast, we grabbed a few snacks there at Oxbow before driving to our first stop for the day: Chandon. Over the last year or so, I’ve really started enjoyed sparkling wine. We went to Mumm during our last trip and thought it would be fun to check out another place that specialized in sparkling wine. It didn’t take much research to find Chandon. Y’all. This place was amazing! We may or may not have joined their wine club… any friends want to join us for some sparkling wine? Our tour at Chandon was one of our favorites of this trip. We were a small group of just four people, so we got to spend a lot of time with our super sweet tour guide, who was great at answering all of our (mainly Chip’s) questions. The grounds were incredibly beautiful and we had a great view of the lawn as we had our final tasting. Our tour ran a little longer than we had planned, so we had to rush out to our next tour after signing up for the Chandon wine club. Don’t worry, we stopped by the next morning for some pictures! After Chandon, we had our tour at Frog’s Leap. This was our third time at this winery. We had done their garden tasting during our first trip, and the tour during our second. For this third trip, we decided to do the signature seating tasting. I’ve said it before, but what we love about Frog’s Leap is how casual the environment and how beautiful the grounds are. It’s a unique combination to enjoy some really great wine while also feeling really comfortable in the laid back setting. On our way out of Frog’s Leap, we decided to make a quick pit-stop for some food at Gott’s Roadside. Let me tell you, nothing goes better with wine than a good hotdog and chocolate milkshake. For our last winery, we went to Sterling Vineyards. We had someone recommend Sterling to us, and after reading about the winery, we decided to check it out. A highlight to Sterling is their gondola with views of the wine country. We were excited for these views, but we were worried it was a tourist attraction and that the tour wouldn’t be that great. Maybe it’s because we did the self-guided tour, but we were underwhelmed with our time at Sterling. We enjoyed the gondola and took tons of pictures from up in the air, but the tour itself was made of videos at the different “stops, ” so there wasn’t much room to learn more or interact and ask questions. I’m glad this was the last tour of our trip so it wasn’t the first time we were learning about the wine making process. This entry was posted in Eating Out, Trips and Travels and tagged Bistro Don Giovanni, Chandon, Domaine Chandon, Frog's Leap, Gott's Roadside, Napa, Oxbow Public Market, RiverPointe, RiverPointe Napa Valley, Sparkling Wine, Sterling Vineyards, Torc, travel, Vacation, Wine Country, Wine Tasting on February 9, 2016 by the nance familia.